This recipe is pretty straightforward. The original called for using frozen spinach and canned mushrooms. Since I had only fresh spinach and mushrooms on hand, I adapted this recipe and even added crumbled bacon. The recipe also works well if you wanted to make mini quiche in a mini muffin pan. Also, if you wanted a completely meatless meal, omit the crumbled bacon. Prepare a pie plate with the pie crust and set set aside. In a medium skillet, heat the olive oil over medium heat. Saute garlic and onion in butter until lightly browned, about 7 minutes. Stir in mushrooms and sauté until slightly caramelized. Once the mushrooms have caramelized (about 7-10 minutes), add the fresh spinach in small batches. They will wilt down quickly so you can add the entire amount slowly. Stir in the crumbled bacon. Transfer the mushroom and spinach mixture into the prepared pie plate. Sprinkle 1/2 cup Cheddar cheese and crumble all the feta over the mushroom and spinach mixture. Season with salt and pepper. In a medium bowl, whisk together eggs and milk. Season with salt and pepper. 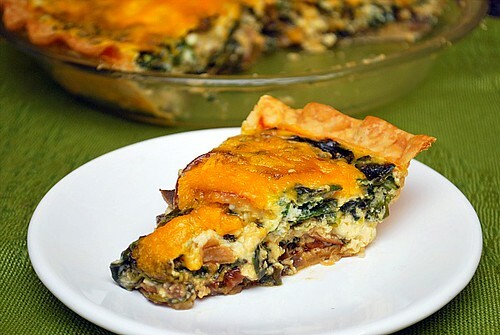 Pour into the pie crust over the spinach and mushroom mixture. Bake in preheated oven for 30 minutes. Sprinkle top with remaining Cheddar cheese, and bake an additional 15 minutes, until set in center. Allow to stand 10 minutes before serving. I thought I didn't like mushrooms. I tried them years ago and at that time it was true. I didn't like them. After watching an episode of Sesame Street with my three year old, I was inspired to try them again-cuz I might like them. Elmo was right, they were not so bad. Now I'm collecting mushroom recipes. This one has been added. I've been showing quiche a lot of love lately, too. I think it's going to hit the rotation a lot this summer with all the fresh veggies I will need to use up! Umm. just a couple small things. Awesome recipe- it says use olive oil in ingredients butter in the recipe. Made it both ways- butter is better. Also it is NOT 2 pounds of spinach- maybe two cups? I used more and added broccoli, used scallions and shallots also. Great recipe to add to.